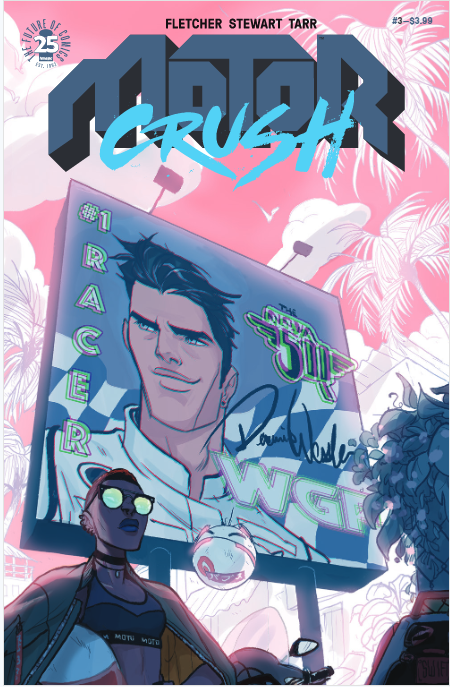 This review contains mild spoilers for Motor Crush issue #3. Welcome back to review central for the new series Motor Crush! With issue three, we now have all the principal players of the story; but that simply creates the question of whether or not the story can keep up its momentum. Strangely enough, this is also where things slow down. The cover for issue three teases the big race against Decimus Wexler that Domino bet on last issue, but he only appears for a brief moment to establish his own talent. Instead, the focus is on the effects of recent events on Domino itself. As her supply of life-saving Crush is still very low; Domino is trying to push herself further and further without using any of it. Immediately, the first notable thing is that the art retains its kinetic feel, but now it is focused on the very visible pain that Domino is suffering from. Meanwhile, the Producers have begun to send messages to Dom to remind her both of the bet and what will likely happen should she lose. This tension coupled with the pain changes Domino’s demeanor and it shows in the art. Concerned for her performance, Dom turns again to Lola for help. I really like Lola. She served as just a jilted lover in trouble at first, now we get to see her interact with Domino a bit more casually, and they’re great together. There is a powerful chemistry between these two that shines like a diamond. Since the pacing has slowed down, the rest of the issue takes some time to flesh out more details about how the WGP actually works. As the WGP is going to form the plot direction, this is welcome. There isn’t a single race, but an exhibition race prior to set expectations and test equipment. Domino loses this exhibition as a result of her withdrawal, and we learn both that this doesn’t actually impact ranking and that Lola does not know of Domino’s needs. In this sequence, I got a sense of what else might be informing Motor Crush’s structure that I didn’t see before. It’s starting to look like Motor Crush is going to follow some anime/manga designs when it comes to the WGP. I can’t speak to it for certain, and if I notice it more I might go into detail in a separate piece, but it feels familiar. 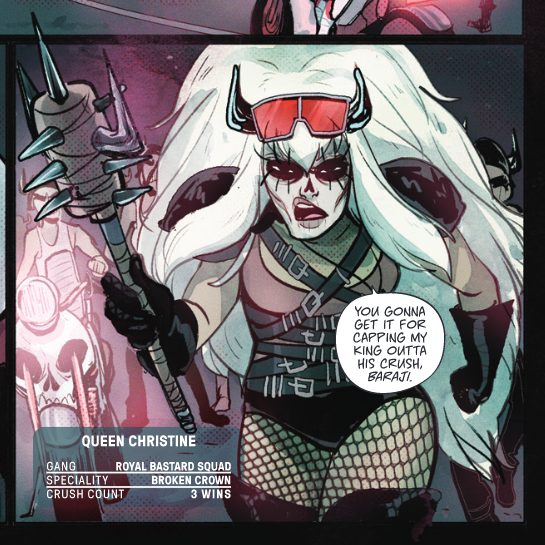 This Mad Max meets Black Canary costume is brilliant. Thankfully, the team knows these racers at this point are more interesting, so this is the race that actually plays out. Once again, the art is brilliant due to its ability to stay aware of all the motion in the scene from panel to panel. That awareness is appreciated especially here, given the cliff-hanger waiting at the end, which I have no desire to spoil here. 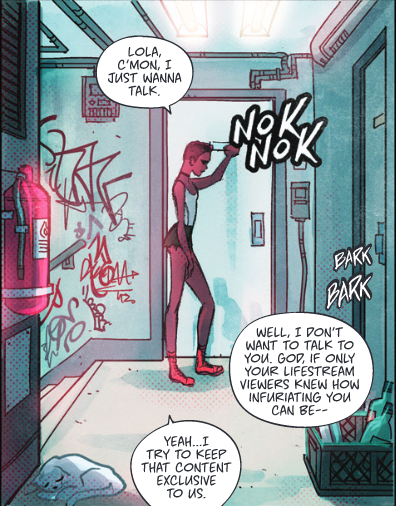 Stewart, Fletcher, and Tarr hit another home run in Motor Crush issue three. I am again excited to see what happens next in the story. I do hope to see more of Lola in a casual environment, since when she’s in mechanic mode she can’t reach too far outside of her responsibility but plays off of Domino too well to stay in the garage. As for the WGP itself, I’ll be curious to see if my senses are right about things playing out using the aforementioned anime style structure, since we don’t really see complete arcs built individually in Western comics. All in all, I can’t recommend this new issue highly enough. Next ArticleTV Review: Fresh Off the Boat (3x12) "Sisters Without Subtext"